Work trips can be fun. Exhausting, but fun. This past weekend, a couple co-workers and I headed to Detroit for the weekend. Our day started early on Friday in Grand Rapids and finally wrapped up late Monday afternoon. In between, we spent the whole weekend in downtown Detroit putting in 16+ hour days. On the first night, we were sitting around near the end of the day and started talking about dinner. The last thing we had eaten was McDonalds in Lansing about ten hours ago. It was getting pretty late and we weren’t really sure what was open. We still had about an hour and a half of work left when I suggested pizza. The co-worker that was traveling with me had talked earlier about a pizza place a few blocks from where we were, but couldn’t remember the name of it. I knew exactly what he was talking about. 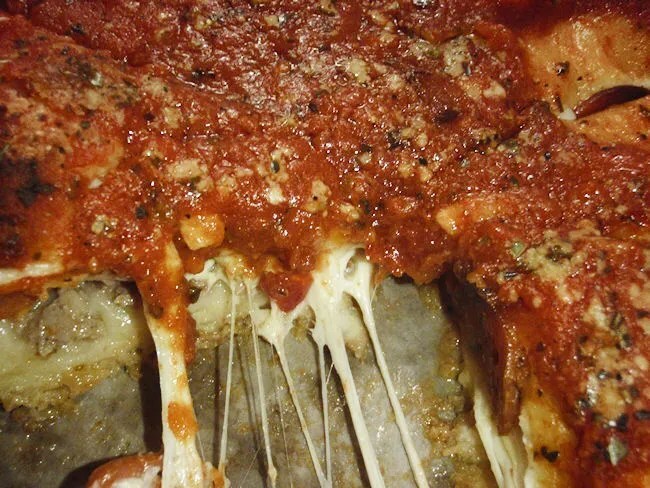 For those that don’t already know, Pizza Papalis is a Detroit chain that specializes in Chicago Style pizza. A few years back, I had carry-out from the Southfield location. 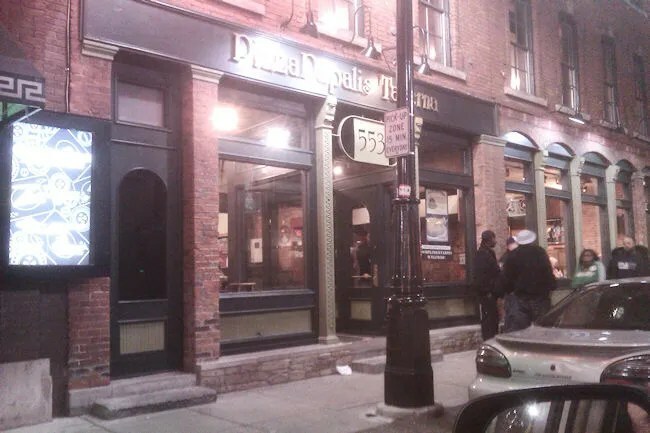 J and I have always attempted to go to Pizza Papalis Taverna in Greektown when we go to Tigers games, but have never had any luck with that. 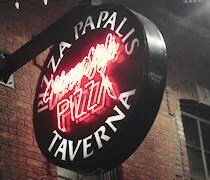 The Pizza Papalis Taverna is on Monroe Street in Detroit’s Greektown. It’s right across the street from the Greektown Casino and within walking distance of both Comerica Park and Ford Field. We decided to put in a carry-out order since we would be picking it up close to midnight. The website says to allow 90 minutes for carry-out, so we used the on-line ordering tool to place our order a little after 10:00. After completing check out, the message says you will receive a call within twenty minutes to confirm the order. Sure enough, about fifteen minutes later, co-worker got that call and was told our pizzas would be ready within about a half hour. That was way too early for us. We wouldn’t be able to pick them up for at least an hour, so we asked if we could push the pick up time back. It didn’t seem to be a problem. After finishing up our work day, we headed to Greektown to pick up the pizzas. There’s not a whole lot of parking in the area, so I double parked right in front of the restaurant while co-worker ran in to pick up the two pizzas. No one seemed to mind that I was double parked. A couple Detroit police cars cruised by and traffic was going around me with no issues. It only took a few minutes for co-worker to grab the two pizzas and head back out to me. Unfortunately, we had about a twenty minute ride to our hotel out in Taylor. Once we got settled in the hotel, I cracked open the box and dug in to my pizza. Each of us ordered 10″ inch pizzas. We figured we could each get a couple of meals out of it and we couldn’t really agree on toppings. Co-worker got pepperoni and mushroom. I ordered the Meat Eater’s Deluxe. I’ve ranted and raved about places calling themselves Chicago-Style when they don’t even come close. Pizza Papalis comes more than close. They nail it. 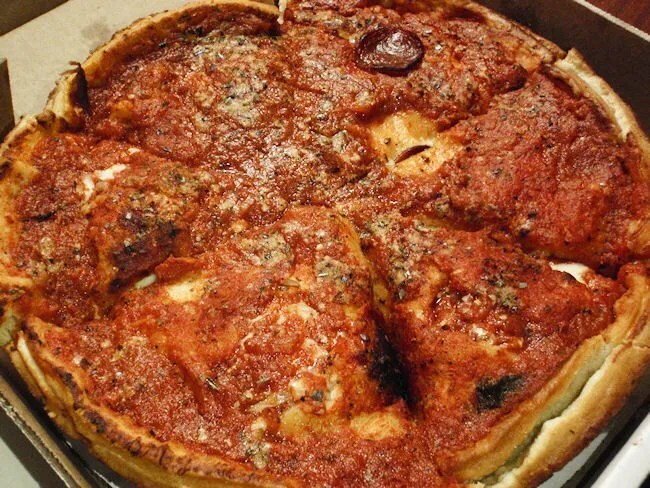 The pizza is in the style of Giordano’s stuffed crust. It starts with the thin, fat heavy crust that melts in your mouth. The toppings are then put on upside down with the meat, in this case, pepperoni, Italian sausage, Canadian bacon, and ground beef, on the bottom followed by the cheese then the sauce. Another crust is layered on top then more crushed tomato sauce and cheese. When the pizza comes right out of the oven, it’s more of a knife and fork deal. It’s almost impossible to pick up and eat like a typical pizza slice. When the pizza cools down a bit, the knife and fork no longer become a necessity. My pizza was packed with large chunks of the various meats and, like a true Chicago-Style pizza, the sauce is a crushed tomato “cold sauce” which isn’t cooked at all until it goes on the pizza and in the oven. The bill for our two pizzas was a little over $40. That sounds like a lot, but I got two dinners out of my small, 10″ pizza while co-worker got three out of his. Pizza Papalis is a delicious pizza. If you’re a fan of Chicago-Style, this is one of the few places outside of Chicago that does it right. If it wasn’t for Buddy’s, Pizza Papalis would be my Detroit pizza pick. Even with Buddy’s, it’s high on the list.